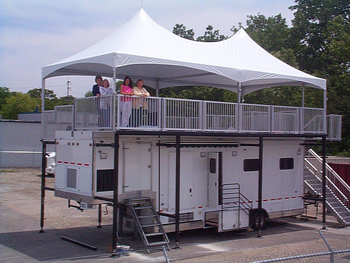 Originally developed for the NASCAR circuit, VIP observation decks double as self-contained living quarters, food preparation areas, offices away from home and remote media broadcasting studios, each with an integral electric power generation system. Silenced power generation systems permit trailer utilization at a a variety of venues including outdoor concerts, golf tournaments, sporting events, religious ceremonies and horse races without concern of disruption to participants or neighbors. Special aeroacoustic silencing system permits free flow of cooling air but stops noise emissions from the engine-generator compartment. ASI Aeroacoustics computational fluid dynamics (CFD) computer program will quickly and easily custom match and select pre-tested silencer modules to specific aerodynamic requirements of radiator, fan or heat exchanger. Inlet and discharge silencer banks are evidenced on left end and left foreground of picture. Engin-generator compartment is fitted with a propietary acoustic absorber consisting of an amalgam of laminated acoustic media with locally reacting liners. Proprietary lamination process provides maximum acoustic performance and fire safety at minimum cost. Highly compact in design and rapid deployment, each VIP trailer provides the epitome of comfort and convenience. ASI Aeroacoustics is pleased to have provided the aeroacoustic analysis, computer simulations, design and fabrication of the unique engine-generator sound attenuation system.